DJzone DJ Magazine :: Take control! Gator's G-Club Controller bags provide top notch protection for the latest DJ controllers. Take control! Gator's G-Club Controller bags provide top notch protection for the latest DJ controllers. Take the worries out of transporting all your precious DJ equipment with Gator's line of G-Club DJ bags. Gator's G-Club series offers durable lightweight solutions for carrying all your various DJ gear and accessories. With today's modern DJ's in mind, the new G-Club Control & G-Club Control 25 bag is the perfect solution for the digital-based entertainer. Designed to securely transport a laptop based midi controller, laptop, and DJ style headphones, this sleek messenger style bag is made of a lightweight durable nylon exterior. The controller bags also features the G-Club's signature orange interior lining for easy visibility in low lighting and dark clubs. The controller sections features thick padding on the front and back as well as an EVA rubber foam bottom for added protection. The large zippered laptop pocket is heavily padded and can hold laptops up to a 17" screen size. The G-CLUB-CONTROL and G-CLUB-CONTROL 25 bag also sports a zippered headphone pouch and side accessory pockets ensure nothing is left behind. Go easy on yourself, throw this bag over your shoulder or carry by your side with its adjustable shoulder strap and thick padded carry handle. The newly released Control 25 bag features an extra-large interior controller section and is designed to fit the Numark Mixdeck and NS6 DJ controllers. The standard size G-Club Control bag is designed to fits the American Audio VMS4 and the Vestax Typhoon. 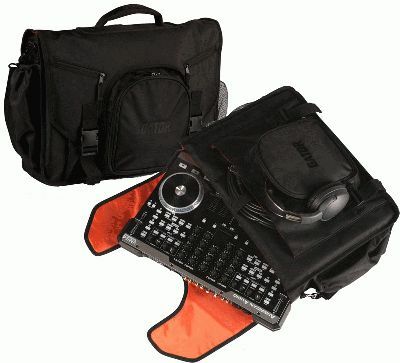 Check out Gator's entire G-Club series of DJ CD player, Mixer, and Controller bags online at www.gatorcases.com.